Located in the western Pacific Ocean, Guam is the largest island in Micronesia and one of five territories occupied by the United States. 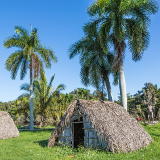 Having previously been subjected to European, Asian and American occupation, this island is a combination of various ethnicities and cultural practices, largely dominated by the Chamorro people. It is a popular destination for sightseeing and beach resorts. Cheap flights to Guam are now available for a limited time only, so book your flight today and experience the cultural influences and tropical beaches of this exotic island! Guam is home to Antonio B. Won Pat International Airport (GUM), a 20-minute drive from the city centre. GUM serves a multitude of airlines, including Delta Airline and United Airlines. There are no direct flights from South Africa to Guam, but popular connecting flights depart from Johannesburg, Cape Town and Durban. Experience the culture and hospitality of the local Chamorro people as you wander through the villages and vibrant night markets, picking up original handicrafts from the skilled artisans. 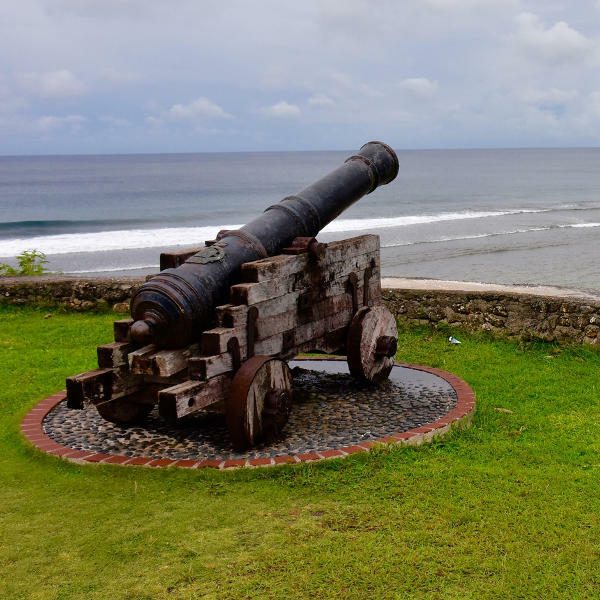 With a history spanning American, Spanish, Portuguese and Japanese rule, remnants of the historical battlefields can be seen in the Pacific National Historical Park and ruins of Fort Apugan. Admire the turquoise lagoons where you can snorkel, swim and jet-ski; or go diving among the shipwrecks of World Wars 1 and 2. 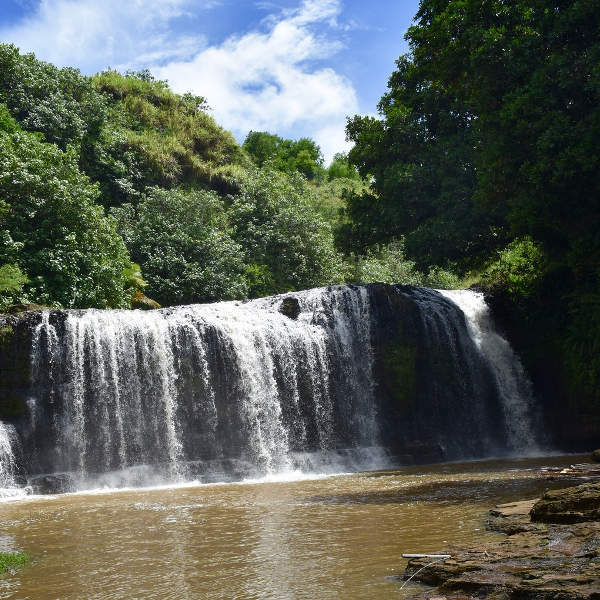 Take a hike up to Talafofo Falls and enjoy the natural beauty of the mountainous landscapes. Guam Island enjoys a tropical climate, with warm temperatures all year round. The sea is warm throughout the year, so anytime is great for swimming and water activities. Because Guam experiences destructive typhoons between May and November, the best time to visit this island is from February to April to be safely out of typhoon season. Should you be on the island during May, you can catch the ever-popular Coconut Festival where food, dancing and music dominate the streets for three days. Liberation Day on 21 July lasts a week, with parades, carnivals and feasts erupting in many villages on the island. Guam is the biggest and most southerly of the Mariana Islands and has served as an army base for the United States since World War Two. It’s a tropical island paradise, with beautiful sandy beaches and coral reefs that teem with wildlife. The island’s beautiful beaches and lagoons offer a selection of activities, including fishing, windsurfing, kayaking, snorkelling and jet skiing. There are also a number of wrecks from the First and Second World Wars for divers to examine among the coral reefs. As the Second World War played a significant role in Guam’s history, many of the attractions date back to 1941, including the commemorative monument at Apra Harbour Overlook that lists those who lost their lives during the three-year Japanese occupation. 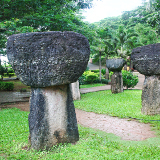 The South Pacific Memorial Park in Yigo and the Pacific National Historical Park are locations of five battle sites with a museum displaying relics and war photographs. The island’s capital, Hagåtῆa, is a charming combination of cultures from Asia, Europe, America and the Pacific Rim. Spanish influences are still heavily prevalent in the language, food and historical features, like Two Lovers Point. For a combination of cultural diversity, historical landmarks and thrilling water sports, Guam offers all of these elements on one island! Compare several airlines, and book your cheap flights to Guam online at Travelstart! South African passport holders require a U.S. visa for Guam. Make sure that your SA passport is valid for 6 months from departure and that there are at least 3 blank pages available for stamps. There is no South African representation in Guam. Contact the U.S. Embassy for further information. Guam is a very safe tourist destination. Exercise the usual precautions of not leaving belongings unattended and keeping valuables hidden. Avoid isolated areas and walking the streets at night. Guam is located in an earthquake zone and has been known to experience a few incidents. Check weather forecasts and general updates to be well-informed of possible typhoons or earthquakes. If you’re planning on diving or other water activities, observe weather patterns and avoid these activities during typhoon season. No vaccinations are required for this region, but it is highly advised to take mosquito repellent and lots of sunscreen. Tap water is safe to drink, but bottled water is also widely available. The cost of healthcare in Guam is high, so it is advised to take out comprehensive travel insurance before travelling. Tumon Bay is the epicentre of tourist accommodation, offering premier beach resorts and hotels. This is prime location for duty-free shopping stores and some great restaurants. For cheaper accommodation, the hotels in Harmon cater for those with overnight layovers for connecting flights. Check if your hotel offers airport pickup, as taxis can work out to be quite expensive. The neighbourhoods of Hagåtῆa, Tamuning, Mangilao and Maite all offer business hotels and family style accommodation, close to interesting attractions. Since the island is small, the airport is within close proximity to all areas. Major hotels serve both continental and ethnic cuisine, but to really experience the fusion of Chamorro gastronomy, walk around and sample local food from roadside vendors and traditional eateries. 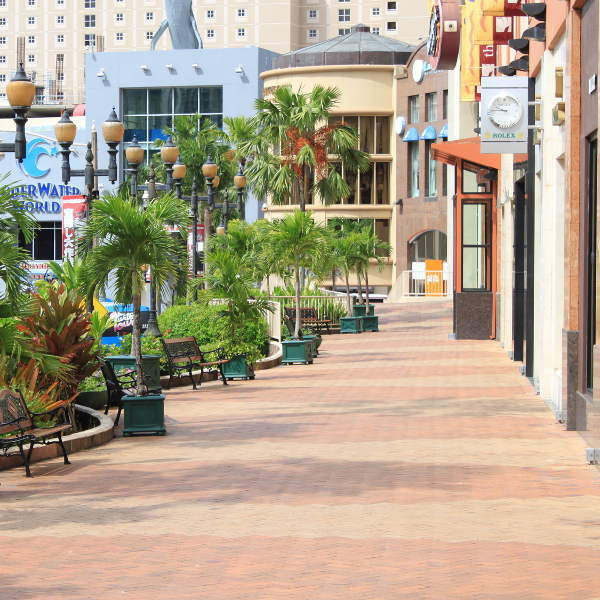 Walking around is best done in the central area of Hagåtῆa and Tumon Bay, where the streets are more favourable to pedestrians. Many hotels in Tumon are pit stops for the Tourist Shopping Bus, which travels north and south of the island (so be sure to pick the right one!). These buses run frequently and cost around $5 for a one-way ticket. If you have the luxury of time, you can get around on the public buses, but prepare to wait up to two hours for a bus. Although this is the cheapest transport option, bus schedules are very unpredictable. Alternatively, you may want to rent a car, though be aware that traffic congestion is a frequent occurrence. Older vehicles called “Guam Bombs” are affordable and easy to navigate.